Since 1996, I’ve been a Tarot and Oracle Card Reader. At one point in the year 2001, I had a part time job on a psychic hotline where I did readings from Chesca Potter’s The Greenwood Tarot deck. This deck has been out of print for some time and was highly saught-after over the last decade. 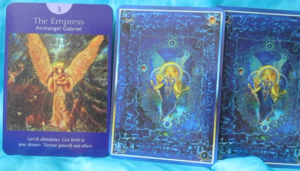 In 2013 I sold this deck to another person in order to take Doreen Virtue’s Certified Angel Card Reader Course, and for a few years, didn’t give my tarot reading past much thought. However, in 2017 I purchased once again The Greenwood Tarot, for about the same price I sold it for years prior, which has re-invigorated my love for giving readings. 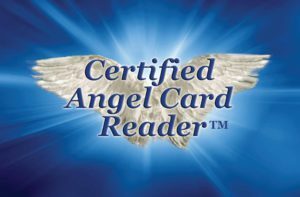 Historically, angels have always “shown up” in my dreams throughout my life, so becoming a Certified Angel Card Reader seemed a logical step. I deeply value Doreen Virtue’s adaptation of the Tarot to encompass non-denominational Angels, and to bring in concepts of inclusivity, spiritual healing, and often “less-scary” cards and imagery. To me, the key to a great tarot or oracle card reading is to form the right question. Once the cards are placed, they become mirrors into parts of our mind, our experience, and aspects of our soul’s energy. They can call upon hidden and buried truths, and often times deeper parts of our consciously and unconsciously held beliefs. Sometimes these beliefs serve us, and sometimes they do not. At the same time, I believe that the symbology, story, and images presented in the Tarot can be healing on a trans-personal level. We understand our lives through symbol and story. 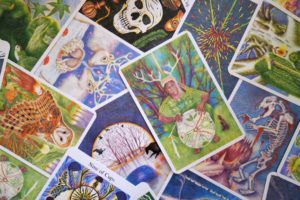 Tarot and Oracle Cards can assist us in “changing brain states” in the moment – to focus on other aspects of a problem or situation we may not have considered. My readings often contain components of intuition, story-telling, encouragement, further questioning, and deep inquiry, so that the recipient can receive their own best answer to their question.